I'm pretty sure my sweet tooth took over this past weekend in a mean way. First there were the Oreo-Stuffed Chocolate Chip Cookies, which apparently were not enough. I've been seeing cake batter this, that, and the other everywhere it seems. Fantastic news, just typically not for dinner. Until I ran across these pancakes on How Sweet It is. I vote if it can be eaten for breakfast, it can be eaten for dinner. Well, maybe except these. Which might qualify more as dessert than anything else. Nah. There's such a thing as glazed doughnuts with sprinkles. I rest my case. In a large bowl, whisk together flour, cake mix, baking powder, sugar and salt. Add 1 cup milk, egg and vanilla extract and whisk until all ingredients are hydrated and the batter is smooth. If the batter is too thick add the remaining 1/2 cup milk, a little at a time until the consistency desired is achieved (should look like regular pancake batter). Gently fold sprinkles into batter. Preheat a large non-stick skillet over medium heat. Once the skillet is hot, pour 1/4 cup batter onto skillet (can make 2-3 pancakes at a time). Let cook until the top of the pancake starts to bubble, about 2-3 minutes, then flip and cook for another minute or two. Meanwhile, in a small bowl, stir together the powdered sugar, vanilla extract, and half of the 1/4 cup milk. Slowly add more milk until a nice pour-able consistency is reached. Serve pancakes drizzled with vanilla glaze. The whole time I was eating these, I couldn't help but think how absolutely perfect they would be for a morning birthday party for little kids, or a pajama sleepover type party. This is one of those dishes that makes you happy to be an adult, feeding yourself, making yourself a super sweet breakfast for dinner because.you.can. I'm pretty sure my mom is shaking her head, yet not the least bit surprised that I would eat this -- for dinner. While these were delicious, I probably wouldn't try eating them for dinner again, and maybe only for a very special occasion have them for breakfast. Although I think part of it is due to knowing there is cake batter in it and I probably "shouldn't" be eating them... wanting to is a whole other story. This cake batter insanity has got to stop - right after I make these pancakes. And yes, I could totally eat these for dinner. how fun are these! excellent idea! Oh that is the cutest thing ever! I can't wait to make these for my son, I think I just got the perfect birthday breakfast idea for him! Thanks! Oh my goodness gracious - is this even legal?!? ;-) Love it! Oh wow these pancakes look amazing! What a great idea to use cake batter. My mouth is watering! Ive been dying to try these!! They look great. Oh these are unreal! And so appropriate for dinner. Wow! 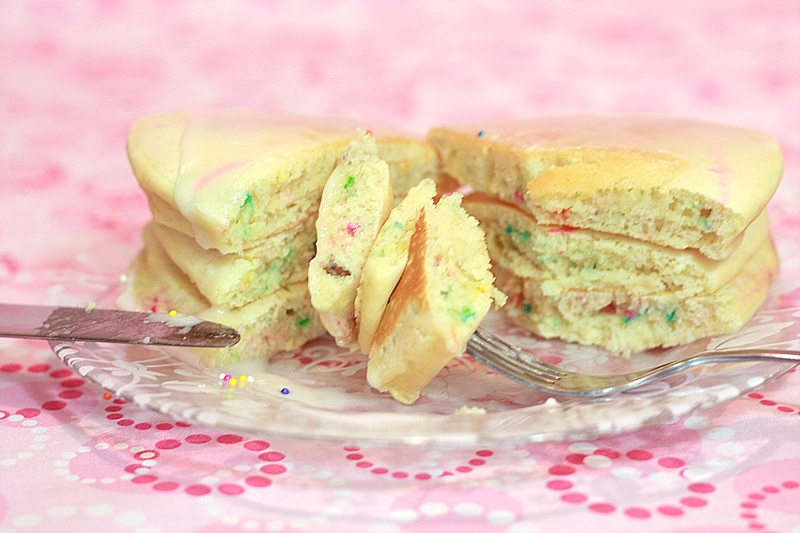 I love creative pancakes and I love cake! These may have to make an appearance in my kitchen very soon! A World of Cake Giveaway Winner! Chocolate Battenberg Cake & a Giveaway!